In stark contrast to a year ago, more than 100 people condemning junta rule marched freely in downtown Bangkok on Sunday. Police had set up barricades to funnel them neatly into a traffic circle commemorating Thailand's constitutional monarchy. There, on the second anniversary of the coup, protesters held a mock referendum on military rule. 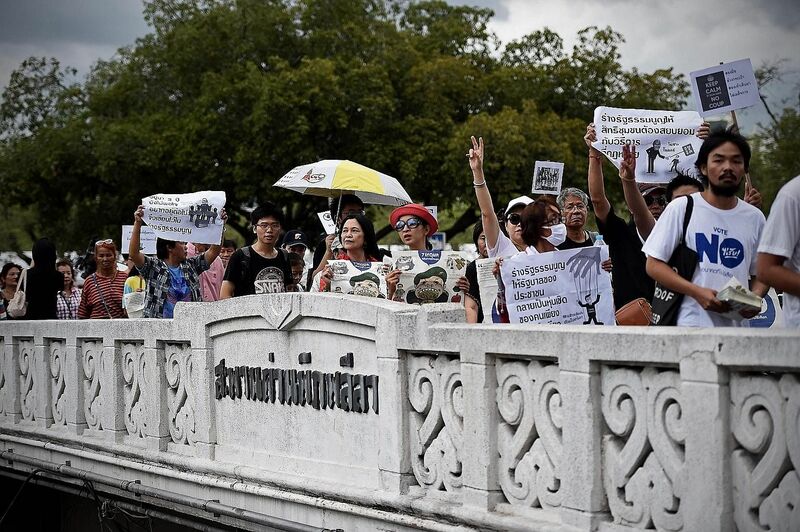 Twelve months earlier, a handful of the same activists trying to rally in Bangkok's commercial and retail district were dragged away by security officers and later detained at a police station. Two years on since the military seized power on May 22, 2014, the junta appears to be recalibrating its grip on the country, but analysts say it is sending mixed signals. "All these recent compromises are too little and too soon," says Human Rights Watch researcher Sunai Phasuk. "We should not rush into any conclusion." While the organisers of Sunday's rally had it easy, a long list of critics have been prosecuted. On Monday, a military court slapped a fine and jail sentence on a 77-year-old man after he gave food and flowers to a democracy activist during a march last year. The three-month jail sentence was suspended. A visiting delegation of European parliamentarians last week declared that "a return to democratic structure and free and fair elections constitutes important conditions for the future development of bilateral relations between the European Union and Thailand". Privately though, some diplomats say they would interpret any election - however encumbered - as progress. Last month, in nearly simultaneous military raids, eight people were rounded up for allegedly posting and disseminating comments on Facebook that mocked Prime Minister Prayut Chan-o-cha. All have been charged with sedition, which carries a jail term of up to seven years, and two have also been charged with lese majeste (insulting or threatening the monarchy), which carries a sentence of up to 15 years. Also swept up consequently was Patnaree Chankij, the 40-year-old widowed mother of increasingly prominent anti-junta activist Sirawith Seritiwat. She was charged with lese majeste for what her lawyers say was simply writing "ja" - a form of acknowledgement - in reply to a Facebook message deemed critical of the Thai royalty. More than 500 people have been detained in the past two years for expressing their opinions, reports legal rights group Internet Law Reform Dialogue. Thailand now has an interim Constitution that, according to its generals' plans, will be replaced by a permanent charter - its 20th - before elections are held. A draft of this document will be put to a referendum on Aug 7. As the date draws near, both the opponents of the junta as well as its members are framing the plebiscite as a gauge of military popularity. Justice Minister Paiboon Kumchaya, for example, has declared he would quit if Thai voters said no to the Constitution. This is a draft charter that will give the junta oversight of the future elected government for at least five years. To Thais who see the military as a steadying hand in the looming royal transition, that is not such a bad thing. Ailing King Bhumibol Adulyadej, 88, had excess fluid drained from his spinal cord and brain, the Royal Household Bureau announced last week. But anti-coup groups are adamant they will not vote for a charter that prolongs military rule, however tempting the prospect of an election. A visiting delegation of European parliamentarians last week declared that "a return to democratic structure and free and fair elections constitutes important conditions for the future development of bilateral relations between the European Union and Thailand". Privately though, some diplomats say they would interpret any election - however encumbered - as progress. There is no such thing as a perfect democracy, one ambassador told The Straits Times recently. Raising too many questions about the conditions under which one election is held would open a can of worms, noted another diplomat - the same uncomfortable lens would have to be used on all the other chequered democracies in the region. But Chulalongkorn University political scientist Pitch Pongsawat says an election would be meaningless if the levers for military control are enshrined in the future Constitution. "An election is not an obstacle for (the military) to stay in power," he says. The bigger question, he adds, is what kind of political power the electorate can live with in the future. A failure to address that issue may just plunge the kingdom back into its cycle of political turmoil, and reduce the occasional sanctioned street protest to an empty symbol.